The name of Bannockburn rings through the ages as one of the most significant in Scottish history but the infamous battle had less impact on the modern town which bears its name than did the advent of eighteenth and nineteenth century industrialisation. Hand weaving in the eighteenth century and coal mining in the nineteenth and early twentieth centuries resulted in spectacular growth and house building. 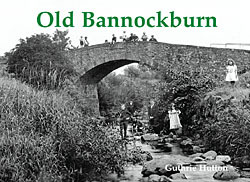 Alas neither of these industries survived into the twenty first century and Bannock burn is now a commuter suburb and host to the tourist coming to seek the battle ground.